Further to my post from last year pointing out how to get Blackberry on a P910i (which is one of the most read posts), after a month of running Blackberry on my P990i I thought I would share the tips in getting it to work. As before a few disclaimers THIS IS NOT OFFICIALLY SUPPORTED! I have it working with a Vodafone SIM with blackberry.net APN enabled and a Vodafone P990i using the Web Client Software. First get the SIS file and install it onto your P990i. Once the install is complete, you may be asked if you want to start any of the applications, just select cancel. 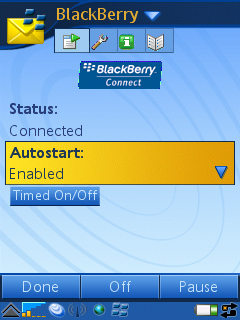 Once it’s restarted in Tools, you’ll have a Blackberry application, open it up. The first prompt will be to set it up. BlackBerry Internet is the choice which I’ve used (you can try BlackBerry Enterprise, but I can’t help out much). Next you’ll need to get a PIN generated, to do this click on the word BlackBerry at the top and then Register now. You should get a Registration Message Sent box appear on your screen. Hopefully by now if you go back into the BlackBerry application and click on the green i icon it’ll show your PIN and IMEI number. Now on the internet with your computer visit http://mobileemail.vodafone.net/ (this is for Vodafone, for other networks you should try Google or calling customer service), then setup a new account, or if you already have a Blackberry account login and find the change handheld option. After a while you should get a Service Book sent down to your phone, and after this you should be able to send and receive emails. You need Blackberry enabled on your account / SIM. You may find that when entering your PIN into the Vodafone site that you get an error message asking you to call 191. If this happens you will need to ask Vodafone very nicely to see if they can help. However more than likely you’ll be told that it’s not supported. 25 Feb 07 – Upgraded to the latest firmware? Try this link direct on the Sony Ericsson website for the new version which works on the P990 and should work on the M600 and W950. The P990 is NOT supported for the Vodafone BlackBerry Connect service.